Devil May Cry Mission 8: Eyeless contains 5 Lost Souls to be collected. You can collect four Lost Souls during your first run-through of the game, while the last one you can collect after receiving the Aquila weapon from mission 10. After destroying the first red crystal you will have a clear view at the blue vine entrance to a room where first Lost Soul can be found. To obtain this Lost Soul you need to return after you obtain Aquila in mission 10. Clear view of the hidden room. As soon as you enter the subway tunnel the next Lost Soul can be found on a wall on the left side. 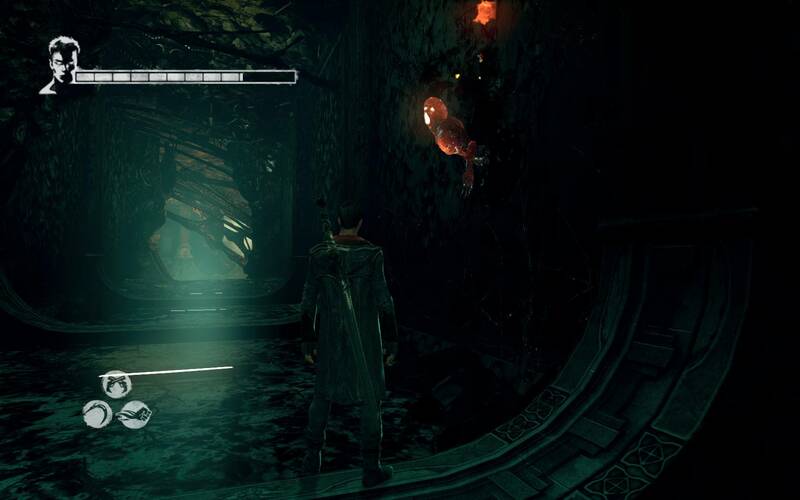 Near the first Divinity Statue you can find another Lost Soul. Going towards the Hapries you will notice two rooms across from one another on the sides of the tunnel. The Lost Soul will be in the one on the right side. Hallway with two rooms across from one another. The one with Lost Soul in it. The next Lost Soul can be found in a hidden room located in the big room where the Demon’s Eye can be found. Look for a yellow upside down sign that reads “Platform 2” and Angel Lift to it. Big room with demon’s eye. Lost Soul at the end of the tunnel. The final Lost Soul is also in a hidden room. This time an upside down sign reading “Platform 1” marks its entrance. You will need to Angel Lift to the enterance. Upside down “Platform 1” sign.